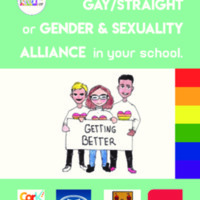 Handbook on Setting up a Gay/Straight or Gender & Sexuality Alliance in your school. Written and produced by the LGBT Society in Cork Institute of Technology. The Handbook aims to help secondary school students create safe spaces and support systems for LGBT students. CIT LGBT Society, “CIT Gay/Straight or Gender & Sexuality Alliance Handbook,” Cork LGBT Archive, accessed April 19, 2019, http://corklgbtarchive.com/items/show/180.